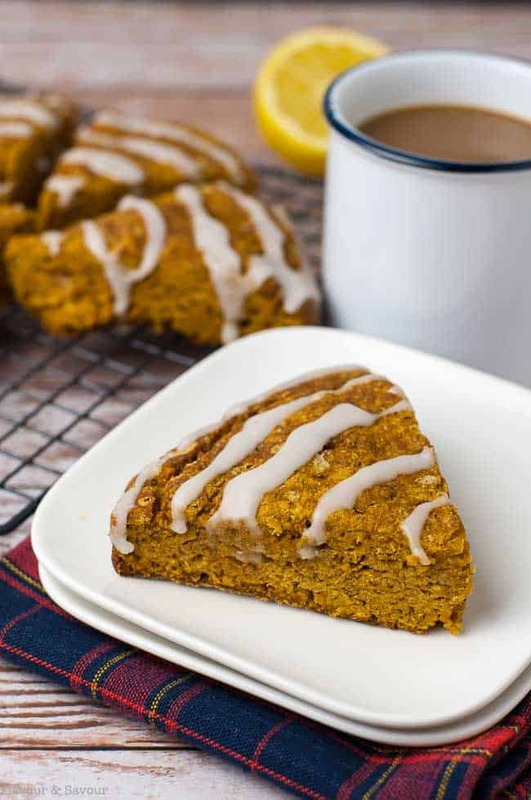 These tender, moist gluten free pumpkin scones are made with brown rice flour, sweetened with coconut palm sugar and flavoured with warm fall spices. Perfect for morning coffee time. 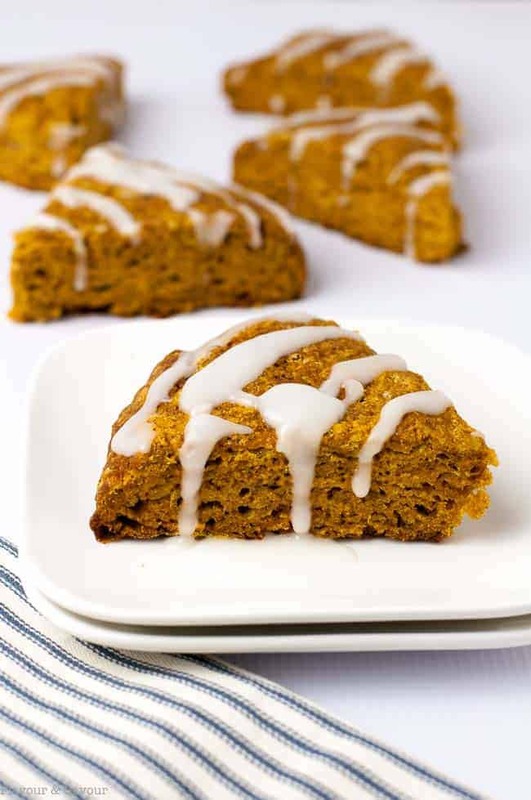 I can’t begin to express how excited I am about these gluten free pumpkin scones! I know that scones are not something to write home about, but I’ve finally discovered a gluten free scone that actually tastes delicious! 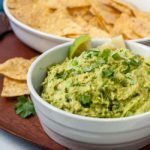 After experimenting with gluten-free 1-1 flour mixes and producing baked goods that tasted like dust, or sand, or sandy dust, I was ready to give up. 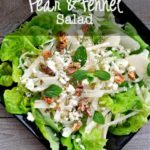 And then I discovered this recipe. 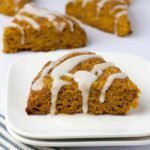 These pumpkin scones are moist and tender and yet, unlike many gluten-free baked goods, they hold together without crumbling! Using a base of brown rice flour gives them a natural nutty and sweet flavour. 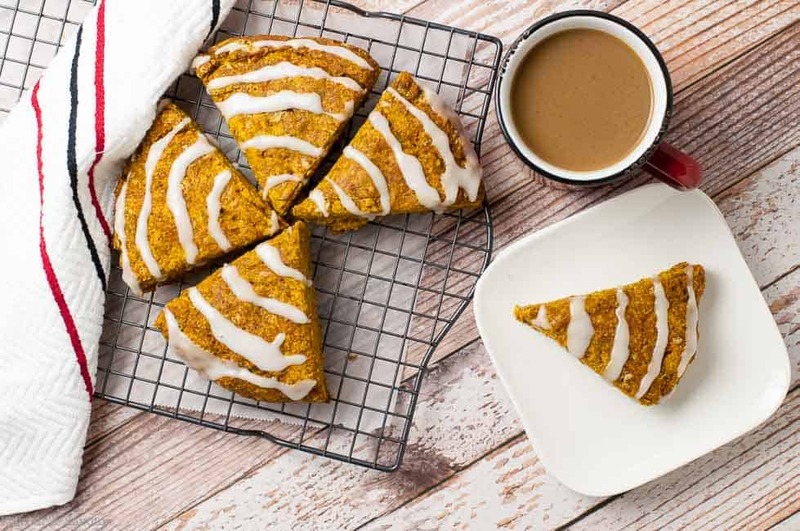 Gently sweetened with coconut palm sugar and flavoured with warm pumpkin spices–cinnamon, nutmeg, ginger, and cloves, these pumpkin scones are perfect for morning coffee time. Last week, I found a recipe for gluten-free Snickerdoodles that I thought sounded good. It used gluten-free 1 – 1 baking flour. While I was wary, I decided to give it a try. I was ecstatic when they came out of the oven nicely rounded with crinkly tops, just the way a good snickerdoodle should be. And then I bit into one. The only thing I can compare that bite to is stepping on a puffball mushroom and watching the puff as a cloud of spores is released. These cookies looked beautiful on the outside, but they were dry and dusty inside. Drier than dry! I was ready to give up on gluten-free baking. But then, I made these lemon glazed pumpkin scones. They turned out so well that now I’m ready to experiment with other flavours. I used coconut palm sugar as it has a lower glycemic index than other sugars, but you can substitute brown sugar. Measure the butter and put it in the freezer. When you’re ready to make these scones, grate the frozen butter into the dry ingredients. It will give the scones a lighter, flaky texture. 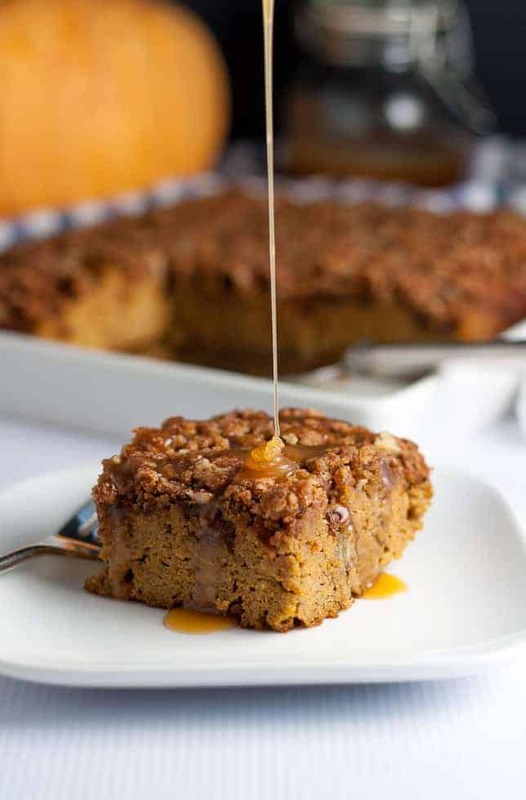 Use 1 3/4 tsp pumpkin pie spice in place of the cinnamon, nutmeg, ginger and cloves if you have it on hand. You can substitute milk or cream for the yogurt. I drizzled them with a simple lemon glaze, but it’s not necessary. They’re good just as is, warm from the oven! 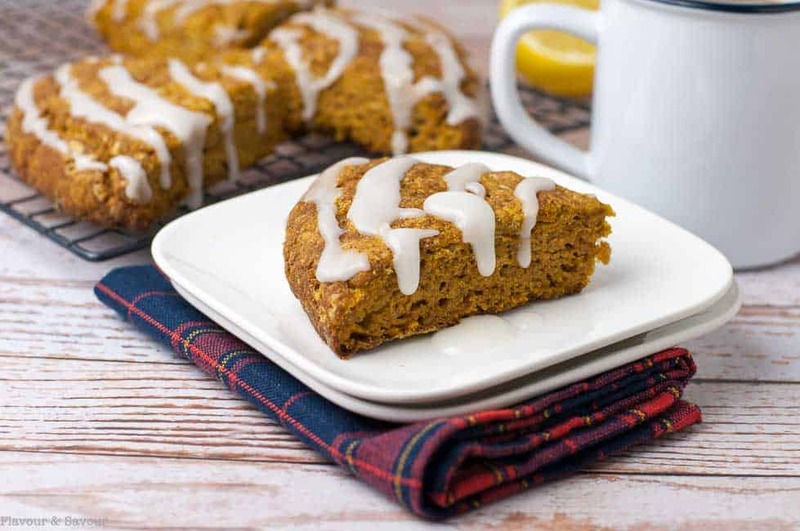 These tender, moist gluten free pumpkin scones are made with brown rice flour, sweetened with coconut palm sugar and flavoured with warm fall spices. Delicious! Combine brown rice flour, sugar, xanthan gum, baking powder, baking soda, salt and spices. Sift into a large bowl. Grate the frozen butter into the dry ingredients. Stir until combined. In a small bowl, combine pumpkin, yogurt and egg. 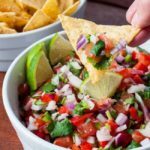 Pour into the large bowl with the dry ingredients and stir until just combined. Do not over mix. Transfer dough to the center of the prepared baking sheet. Cover with a sheet of plastic wrap and using your hands, gently spread out into a disc about 8 inches (20 cm) in diameter. 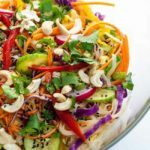 Remove plastic wrap. Slice the disc into 8 triangles. Bake for 15-16 minutes. Remove from oven and cool on a rack. Combine powdered sugar and lemon juice to make the Lemon Glaze. When cool, drizzle with Lemon Glaze. I used coconut palm sugar as it has a lower glycemic index than other sugars, but you can substitute brown sugar. Measure the butter and put it in the freezer. When you're ready to make these scones, grate the frozen butter into the dry ingredients. It will give the scones a lighter, flaky texture. Use 1 3/4 tsp pumpkin pie spice in place of the cinnamon, nutmeg, ginger and cloves, if you have it on hand. You can substitute milk or cream for the yogurt. I drizzled them with a simple lemon glaze, but it's not necessary. They're good just as is, warm from the oven! Looking forward to trying these scones. Greetings from Spain! Hope you enjoy your trip here. Thanks Rebecca! I’ve corrected it. Garlic would definitely not be good in these scones! Looking forward to some Spanish sunshine! These look so perfect for cozy weekend mornings, and I love the little bit of zip with the lemon glaze!